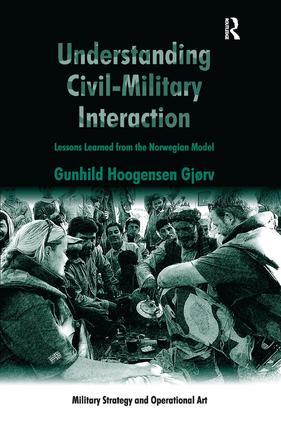 A novel examination of civil-military interaction in particular between militaries and humanitarian actors, in light of the so-called 'Norwegian model' that espouses a clear divide between political and humanitarian (or military and civilian - the model is in fact unclear) actors, while maintaining a tight coordination between them. The Norwegian government has significantly reduced their own military's capacity in the field of civil-military interaction, raising the question as to whether knowledge and skills in this field are necessary. Using a multi-actor security framework, this book examines whether or not the Norwegian government is correct in its assumptions (about both the model and civil-military knowledge amongst military personnel) and concludes that the Norwegian model is a well-meaning but inefficient and problematic model in reality. Although the case study focuses on Norway, the lessons learned are relevant to all nations engaged in civil-military operations. Contents: Part I Introduction, Theory, Core Concepts and Actors: Introduction; Theorizing civil-military interaction: security, legitimacy, authority and obligation; Actors in the civil-military relationship. Part II Norwegian Experiences in Civil-Military Interaction: Norwegian humanitarian policy, the Norwegian model and irresponsible idealism; CIMIC: the ’function-that-shall-not-be-named’. Part III Challenges, Lessons-Learned and Recommendations: ’Hearts-and-minds’ and vacuums; The politics of humanitarian space; Why civil-military interaction? Some recommendations; A Norwegian future in civil-military interaction? ; Conclusion. Appendix: methods and parameters; Bibliography; Index. Gunhild Hoogensen GjÃ¸rv is an Associate Professor at the University of TromsÃ¸, Norway. The Ashgate Series on Military Strategy and Operational Art analyzes and assesses the synergistic interrelationship between joint and combined military operations, national military strategy, grand strategy, and national political objectives in peacetime, as well as during periods of armed conflict. In doing so, the series highlights how various patterns of civil-military relations, as well as styles of political and military leadership influence the outcome of armed conflicts. In addition, the series highlights both the advantages and challenges associated with the joint and combined use of military forces involved in humanitarian relief, nation building, and peacekeeping operations, as well as across the spectrum of conflict extending from limited conflicts fought for limited political objectives to total war fought for unlimited objectives. Finally, the series highlights the complexity and challenges associated with insurgency and counter-insurgency operations, as well as conventional operations and operations involving the possible use of weapons of mass destruction. Scholars and practitioners in the fields of politico-military history, international relations, and national security policy are invited to contribute to this new series as well as faculty at senior and intermediate level service schools involved in professional military education.